Every wanted to know for sure what the pull weight of your trigger is? Made any modifications to your trigger, maybe the “25¢ Glock Trigger Job”? 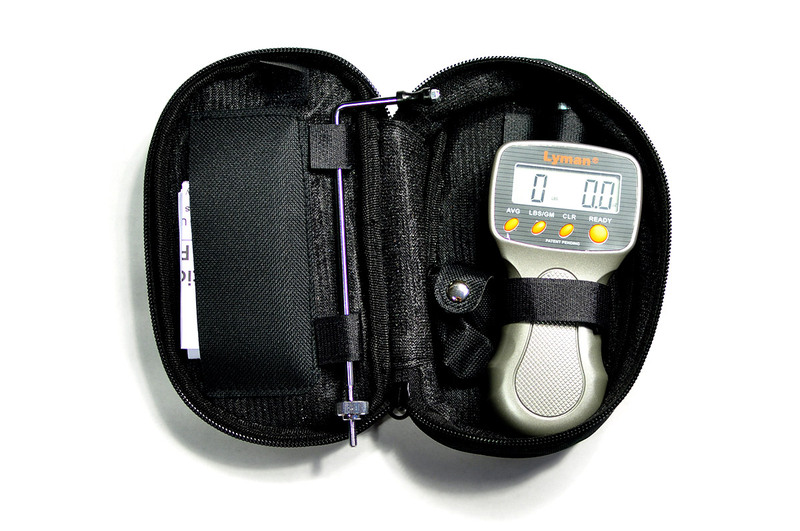 With the Lyman trigger gauge, you can get a decent measurement of you triggers pull weight. So, if you are doing some gunsmithing, or are just curious, you can find out what your trigger pull is set to. This is especially good to know if you are doing any custom trigger work, like polishing or doing upgrades. Before you do any trigger testing, make sure your firearm is unloaded! The trigger gauge has an “L” shaped removable hook with a roller on the end. This hook with a roller is used to actually pull the trigger. The nice thing about the hook is that you can affix it to the actual gauge at any angle. This is important so you can smoothly pull the trigger in a consistent manner. Once you have the hook connected and setup and in a position where you can smoothly pill the trigger, you should place the roller on the trigger close to the position where you place your finger when you are actually shooting the firearm. This will give you the best readings. 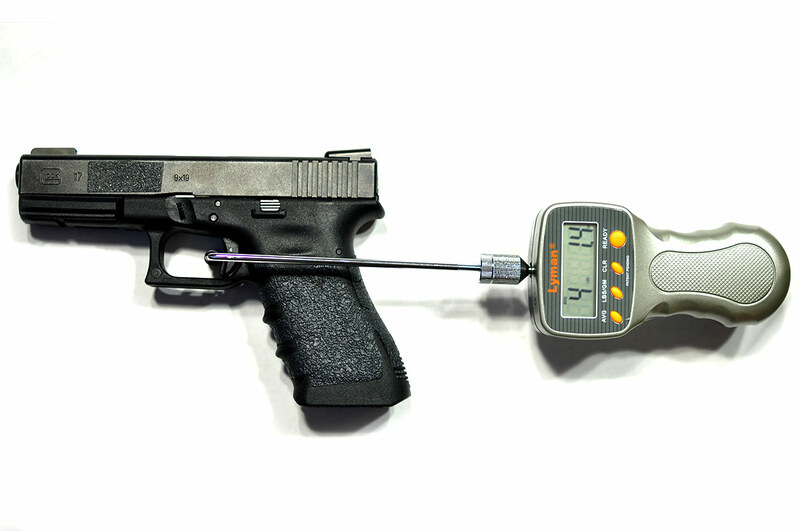 Note: On guns with trigger safeties, like Glock pistols, you have to make sure you are pressing the trigger safety with the puller, otherwise the trigger will not depress. I found that having the gauge sideways on the hook was the easiest to use and actually pull the trigger for most firearms I tried. This had the least interference and allowed me to pull the trigger back more consistently. The process of pulling the trigger is not the easiest if you are trying to hold the firearm with one hand and use the gauge with the other. It gets a little cumbersome to accurately pull the trigger and not drag the puller against the trigger guard or have the puller roll to the top of the trigger. But once you get the little nuances down, everything goes smoothly though. To actually get a good measurement, I found it best to take 4-5 readings, then use the Average feature of the gauge. Individual pull weights can fluctuate a fair amount depending on where the puller was located on the trigger, the angle of pull, etc. So an average is generally the best and most accurate. The gauge will do an average of up to 10 pulls, so you can get a more accurate average if you wish. 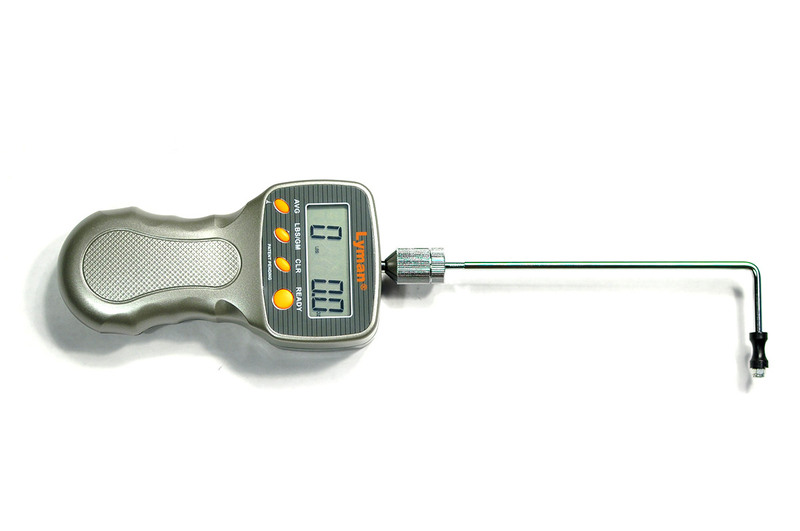 The trigger pull gauge is pretty simple to use, and only offers basic functionality. It’s a little more “complex” than an older style spring gauge, but the trade off of simplicity for accuracy and functionality is worth it in my book. The Lyman gauge is a little more expensive than your older style spring gauge, generally going for around $60 USD plus batteries. You can generally find spring gauges for around $40 USD and they don’t require batteries. For me, the extra money is worth the accuracy and functionality of a digital gauge. But depending on what you are doing, a spring gauge may be a better economical option. 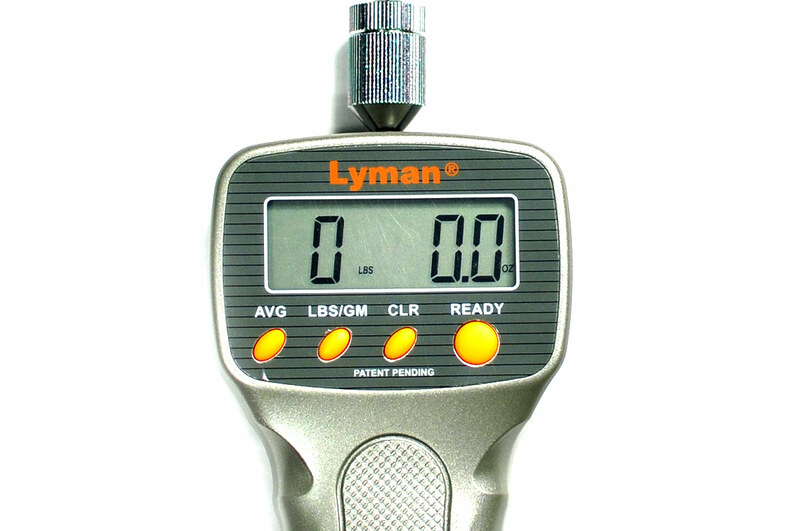 Overall, the Lyman Trigger Pull Gauge is a nice tool to have. It works well, and is great for anyone making modifications to a trigger. That being said, it’s a little pricey for a single use. But for a gunsmith, gun shop or someone who does a lot of work with firearms, it’s a good tool to have at your disposal.